It’s always nice when a celebrity shows that they’re capable of doing something for others, and Jon Hamm did just that and then some this past weekend. 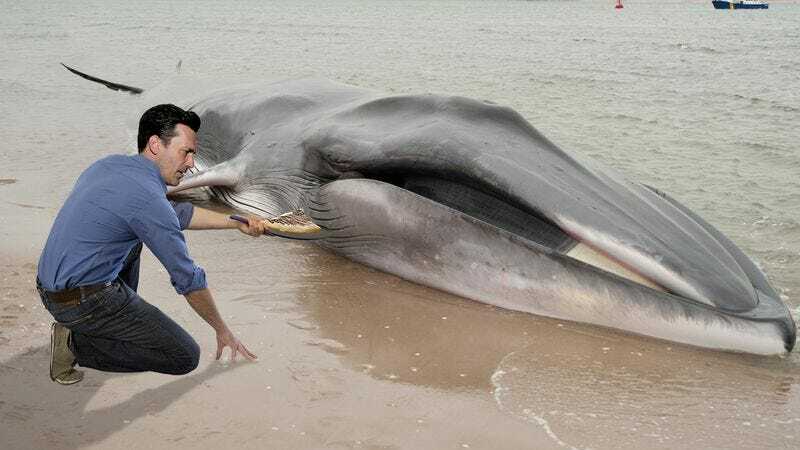 When a whale washed up on a Malibu beach Sunday afternoon, the Mad Men star showed up and made crepes for the struggling creature. According to eyewitness reports, no one knew what to do after the once-majestic ocean dweller emerged on the beach, but before those present could come to a consensus, Hamm appeared and began heating up a crepe pan on the spot. Sure, the crashing waves made it difficult for the pan to retain heat, but the Golden Globe winner selflessly used his body to deflect as much of the cold water as he could. And even as his eyes grew red and irritated from the saltwater, he kept a clear focus on the task at hand! Hamm’s compassion and determination were matched only by his preparedness, as he laid out a selection of crepe ingredients both sweet and savory, from freshly grown peppers and mushrooms to the juiciest strawberries you could imagine. Sources say that despite a lack of formal culinary training, Hamm produced a nearly perfect strawberry and Nutella crepe. But knowing that a whale’s stomach is significantly larger than that of a human, Hamm realized that one wasn’t enough, and he spent the next five hours churning out delicious crepes for this animal in need. When the sun finally began to set, Hamm meticulously and safely packed up his cooking station and disposed of his garbage in the proper receptacles. And as a team of scientists who had gathered to help push the whale back into the ocean began their task, they thanked Hamm for what he had done. But Hamm, eternally humble, refused to take any credit. Though that doesn’t change the fact that he is, without a doubt, the kindest man alive!